I've got gradient nails to show you today. They're really easy and the best part is having fun with different color combinations. I did these gradient nails on a whim and look at how pretty they turned out. If you're going to an event and have no time or no idea what nail design to do, I'd definitely recommend glitter gradient nails. I didn't use the sponging method. Read on to find out how I did the gradient effect. On my left hand, I used China Glaze - Purr-fect Plum and The Face Shop - purple glitter (sorry, I can't find the code on their site). For the accent nail I used China Glaze - First Mate and some glitter polish but I can't remember the exact polish I used. I think it might be China Glaze - Fairy Dust but since it's not holographic, I might be wrong. 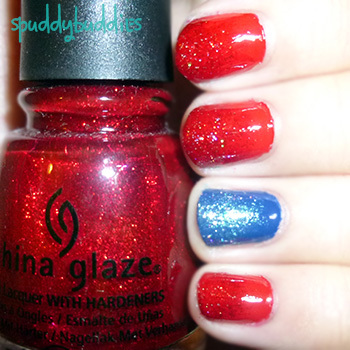 On my right hand, I used China Glaze - Salsa and did the gradient with China Glaze - Ruby Pumps. The red glitter really blended with Salsa which is a creme polish so it came out really pretty. For the accent nail, again I used China Glaze - First Mate and that unknown glitter. First I put on 2 coats of the creme polish and let that dry. Then I scraped off the excess glitter polish from the brush on the inside of the bottle, allowing only the slightest polish on the brush. Then I dabbed on the glitter from the middle of my nail to the tip, making sure there is more concentration of glitter near the tip to create the gradient effect. I repeated step 2 and 3 until I was satisfied with my gradient. I sealed my design with Sally Hansen - Insta Dri top coat. I hope you try this design out! 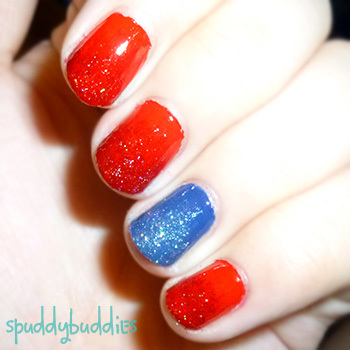 Gradient glitter really does step your nails up a class so it'd be perfect to wear to a wedding or a Christmas party. Let me know what you think of these nails in the comment box. Are they too flashy? Do you like them? 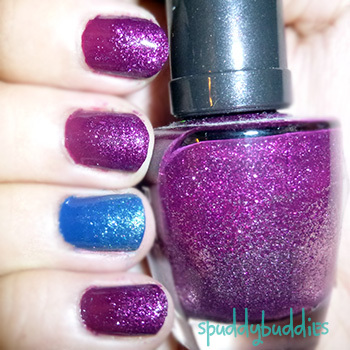 Have you tried gradient nails with glitter polish before? What color combinations would you use?